On the Americans’ arrival, the large ranchos were broken up, and the new, more numerous landowners on smaller parcels of land were less tolerant of Indians. The small ranchos were farmed and grazed more intensively, and this caused an even greater reduction in the Indians’ natural food supply. Jobs once belonging to Indians, especially skilled jobs, were taken by Whites. 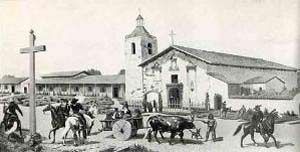 We need only look at the early record of the California Legislature to understand the relationship of the Americans to the native population during this era. 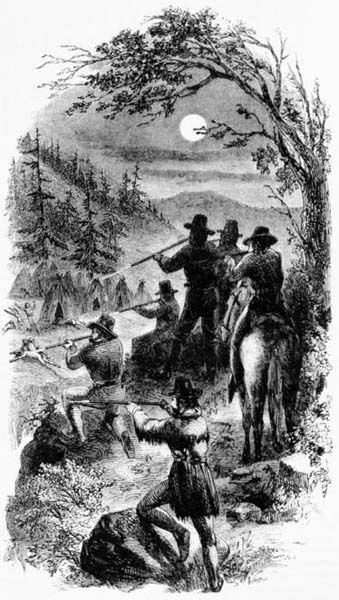 At the first State Constitutional Convention, those assembled voted to eliminate the Indians’ right to vote because they feared the control Indians might exercise. 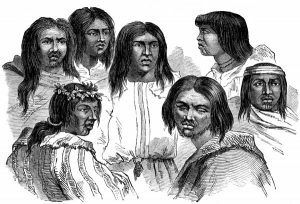 In 1850, a law was enacted by the first session of the State Legislature, which set the tone for Indian-White relations to come. If any Indian was convicted of a crime, any white person could come before the court and contract for the Indian’s services, and in return, would pay the Indian’s fine. It would be illegal to sell or administer alcohol to Indians. Finally, an Indian found strolling, loitering where alcohol was sold, begging, or leading a profligate course of life would be liable for arrest. The justice, mayor, or recorder would make out a warrant. Within 24 hours, the services of the Indian in question could be sold to the highest bidder. The term of service would not exceed four months. This law was widely abused with regard to the use of Indians as laborers, though it did allow Indians to reside on private land. During 1851 and 1852, the California Legislature authorized payment of $1,100,000 for the “suppression of Indian hostilities.” Again, in 1857, the Legislature issued bonds for $410,000 for the same purpose. While theoretically attempting to resolve White-Indian conflicts, these payments only encouraged whites to form volunteer companies and try to eliminate all the Indians in California. In 1860, the law of 1850 was amended to state that Indian children and any vagrant Indian could be put under the custody of whites for the purpose of employment and training. Under the law, it was possible to retain the service of Indians until 40 years of age for men and 35 years of age for women. This continued the practice of Indian slavery and made it legal for Indians to be retained for a longer period of time and be taken at a younger age. The other practice that provided much of the labor force, especially in southern California, was to have city officials pick up Indians as vagrants. These officials would then turn the Indians over to the ranchers and other people who needed laborers. This was all done under the provisions of the 1850 law. After four months or some other term of service, the employer would return the Indians to the city, usually to a place where alcohol was served. Shortly after their return, the Indians would be picked up once again as vagrants and returned to the labor force.